University Provost Stephen Freedman, Ph.D., whose commitment to local and global academic partnerships enhanced Fordham’s reputation in New York City and around the world, died suddenly on July 2 at his home in Hastings-on-Hudson, New York. He was 68. Freedman joined Fordham in 2007 as senior vice president for academic affairs and chief academic officer. He was appointed provost in 2010. “For more than a decade, Stephen served Fordham tirelessly. He was known for his devotion to the faculty, students, and the academic community, and for his commitment to research and a global university,” said Joseph M. McShane, S.J., president of Fordham. 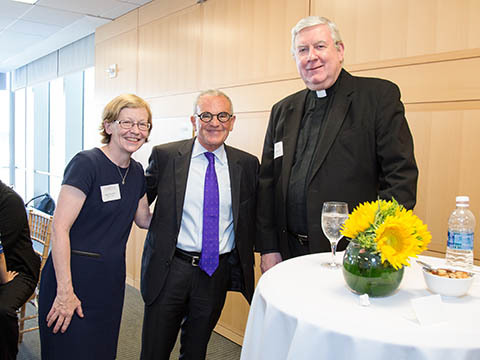 Dr. Freedman with Maura Mast, dean, Fordham College at Rose Hill, and Robert Grimes, S.J., vice dean of Fordham College at Lincoln Center for special projects and initiatives, at the 2017 International Parents Reception. As provost, Freedman oversaw the operations of the University’s nine schools as well as the Fordham Libraries, Fordham University Press, WFUV, institutional research, prestigious fellowships, and Fordham’s efforts in international education. Freedman saw tremendous potential in establishing and strengthening partnerships between Fordham and other world-class institutions, whether they be across Southern Boulevard in the Bronx or across the Atlantic in London. A professor of ecology and evolutionary biology in addition to his role as provost, Freedman was instrumental in forging the Bronx Science Consortium—a research partnership between the University, the Albert Einstein College of Medicine/Yeshiva University, the Bronx Zoo/Wildlife Conservation Society, Montefiore Medical Center, and the New York Botanical Garden. The consortium offered numerous hands-on opportunities for undergraduate and graduate students to collaborate with some of the top researchers in the world. Further abroad, he oversaw the progress of Fordham’s new London Centre campus, set to open this fall. In December 2017, when the University signed the lease on the new space, Freedman noted the many possibilities for scholarship beyond the traditional semester abroad. Freedman traveled extensively on Fordham’s behalf, overseeing the University’s international programs—and developing new ones. In May, he led the first Fordham Faculty Research Abroad Program at Sophia University in Tokyo. That same month, he celebrated the 20th anniversary of Fordham’s Beijing International MBA (BiMBA) program in China. 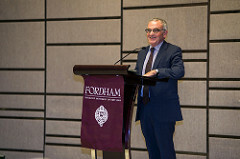 Dr. Freedman addresses Fordham alumni in Bejing, China, in 2015. “He would often say that one of the responsibilities that the board gave him when he became provost was to develop an international strategy for Fordham, and so he took that seriously,” said Jonathan Crystal, Ph.D., interim vice president and chief academic officer in the Office of the Provost. Freedman worked closely with his faculty colleagues to develop new ideas and initiatives at home as well as abroad. 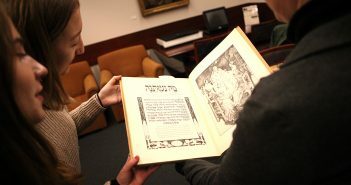 “He was very committed to the faculty,” said Magda Teter, Ph.D., the Shvidler Chair in Judaic Studies and professor of history at Fordham. “Once a faculty member too, he understood our work and the challenges we face. He was very strongly supportive and extremely warm,” she said through tears. Teter said Freedman was “one of the key figures” in the development of Fordham’s Jewish Studies program, which Teter directs. 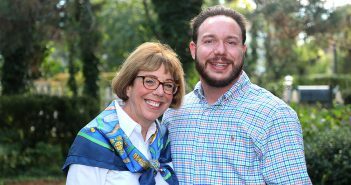 She also said he was extremely proud to be the Jewish provost of a Jesuit university. “He would always bring it up as a mark of pride in Fordham. He felt it spoke volumes about Fordham and its ethos of inclusion,” she said. “My own scientific and religious backgrounds have enhanced each other, and I think informed discussions between theologians and scientists play a critical role in the shaping of ideas,” he said. A native of Montreal, Freedman earned a B.S. from Loyola of Montreal, an M.S. in environmental studies from York University in Toronto, and a Ph.D. in ecology and evolutionary biology from the University of California at Irvine. He also completed the United Nations Graduate Study Program in Geneva. He has spent nearly his entire career at Jesuit Universities; for 24 years he was at Loyola University of Chicago, where he taught biology and served as dean of Mundelein College. From 2002 until 2007, he was academic vice president at Gonzaga University in Spokane, Washington. Freedman is survived by his wife, Eileen; his sons, Zac and Noah; and his grandson Aaron. Fordham will hold a memorial service to honor him in the fall.